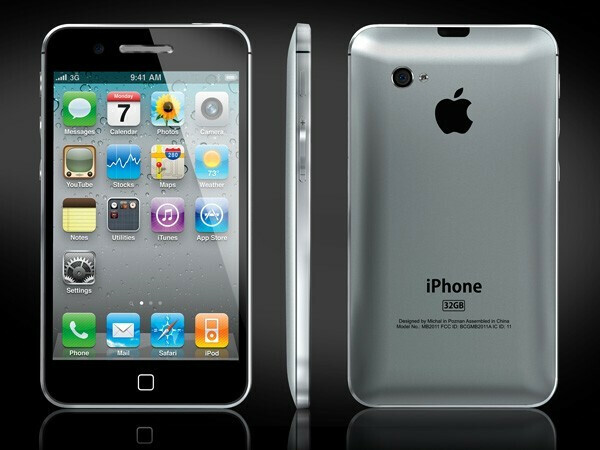 Even if there is going to be a cheaper sidekick to the next iPhone for Apple to work on its market share in the huge prepaid market, we are all probably wondering how the high-end version will look like, since "evolution of the iPhone 4" doesn't sound as exciting as "revolution" would now, does it? Two professional graphic designers have tried to visualize what the next iPhone might look like, based on the numerous stories bandied around in terms of screen size, materials, form and button placements. We'll leave it up to you to decide if they have succeeded, but we won't know for sure what Apple has in store for us until the grand unveiling which is rumored to come around September. The first concept has been posted on Yanko Design, and is from Michal Bonikowski. While it doesn't really follow all rumors to the letter, it still gives preference to the one that says Apple will dispose with the fragile and easily-scratched glass back for some sort of metal, although an entire aluminum sheet as in the concept seems unlikely since it will prevent signal from penetrating properly. The other one, from the designer Antonello Falcone, is bolder, suggesting a 4.6" edge-to-edge display with curved glass edges that could allow a reduction in the thickness of the device down to 8.4 mm. 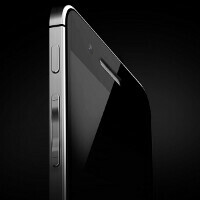 The designer ditches the infamous iPhone 4 frame, which is replaced by two strips of aluminum on the sides, and he also transforms the home button to soft touch capacitive one. He didn't stop with the hardware, though, and drew an imaginative concept of "Dashboard widgets", for an imaginary iOS 5.1 update, that reverses the iOS 5 Notification Center idea. Be reversing we mean you slide from bottom to top from the dock, and call a panel full of widgets, not like now, where both widgets and notifications are cluttering the Notification Center panel. The widgets are listed each with its transparent dock, that displays the name of the widget and a live icon. The same bottom to top slide movement opens it in its full glory from this transparent panel, which is fully customizable. The guy demonstrates the concept in the renders above with a Google search widget. How do you like them Italian designs? Thank you for the constructive comment. I will thumb it up. Why don't you two, get a room!! this changes nothing again again except idrones bank balance! I have said it before and I will say it again - iOS 5 and iPhone 5 are Apple's last chance of competing with Android - and yes that means that regardless of hardware, Apple will have to deliver a much better UE with iOS 5 on launch day - which means that iOS5 will have to be much better than "iCloud backup + Notifications + other minor tweaks". An "iPhone 5" With the same hardware as the iPad 2 - and iOS 5 as it was presented to us in WWDC 2011 will be an insane downfall.. Thanks for the prediction Nostradamus but if you look at reality iOS isn't going away anytime soon. The notifications and iCloud aren't signs of a company no longer being able to innovate, they're signs of a mature platform. Maybe you should try forming your opinion based on facts instead of fanboy delusions. I would say that blatantly ripping off features from Android is the absolute opposite of innovation. Oh and before you call me a fanboy, let me say that I was Apple's advocate in many arguments over the past year - and I've seen people mocking and bashing it - while I was defending it vigorously. And I bought an iPhone 4 in Sep '10 - and I still love it - but Android in 2010 is not Android as it is now - and now - Android is way way way better than iOS as a software (given that Apple has no hidden tricks for us in iOS 5) - and high-end Android phones are also much better in their hardware - save for the screen resolution - which if you heard - will probably be mitigated by the Nexus Prime or whatever it's called. 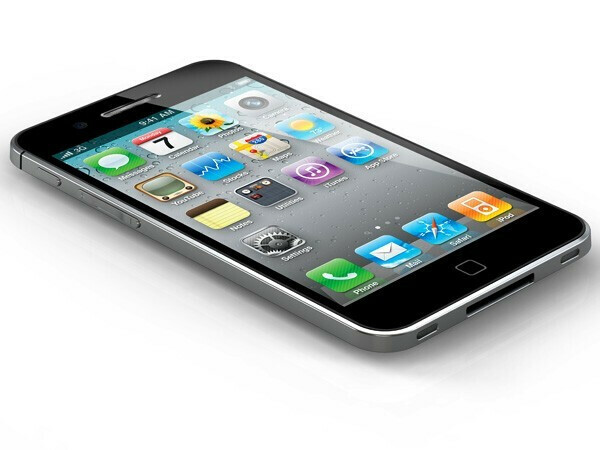 The iPhone 4 was awesome in 2010. It's still good now - hardware-wise. However, everyone expected iOS 5 will be truly innovative.. concepts of Widget screens, better multi-tasking, and other things have been floating around for some time until WWDC.. and then this guy who is responsible for iOS software development comes along and uncovers only Notification Center and iCloud wireless syncing.. iOS 2.0 was in 2008 - and it introduced the App store and numerous tweaks - that's fine. iOS 3.0 was in 2009 - and it introduced copy\cut\paste, landscape keyboard and some more tweaks.. that's fine even though by that time Android was already rising up. iOS 4.0 introduced Folders, multi-tasking and home-screen wallpapers. Overall not bad, and indeed much much needed in mid 2010. You see - each new version was more significant feature-wise than the previous one. Not so with iOS 5. Not so at all. It doesn't seem like iOS 5. It seems more like iOS 4.5. And I tell you right now - Apple fanatics and purists can continue to buy iPhones for the next 100 years or so - but unless Apple releases some revolutionary tweaks to it's UI - instead of that boring set of icons which already was old in 2009 - A lot of people - myself included - will buy a phone with a Green Robot on it. So what features is iOS missing? It's a mature platform, it doesn't need useless features added on just to appease your short sighted sense of competitiveness, especially when every android update is nothing but incremental features. Adding on features just to pad the update list to look better is how bloatware is born (read:Norton, McAfee). They also don't need to do much to the OS when the App store already makes it the better platform. The App Store is a thriving software ecosystem. The Android Market is full of crappy free apps, soundboards, knockoffs and second-rate ports. And it's not a ripoff when you do it better. "They also don't need to do much to the OS when the App store already makes it the better platform" You see that's sort of thinking is exactly what's leading companies like Nokia and RIM to death. You don't sit on your laurels when you're successful. Even more importantly - you don't sit on your laurels when the competition has more than 2x market share than you do - AND and OS with 2x - 3x more features than yours is - which for many many many many people are far from useless. And the Notification center is indeed not a ripoff - since it MUCH WORSE than what's going on Android. Because On Android people get to have quick-settings on it - something that's only enabled on the iOS5 via a hack in Cydia. And please don't tell me that it's better because it got weather and stocks - which is NOTHING compared to the amoung of WIDGETS Android has - on it's Home screen - and without the need to swipe to access them. I used to be a huge Apple fan - I defended the iPhone 4 during the Antenna crisis, I claimed that Apple knows what they're doing, I believed that Android will stop growing in one point or another = but after WWDC - I was so underwhelmed by the announcements - that unless Steve get's a huge bunny out of his magic hat - I will no longer support iOS. here lies iphone. who once led. who once innovated. who once was idolized by others, lies here, in the year of 2011, dead. B/c of greed, and political slivering, trying to buy off, hush up, and silence others whom might challenge their product, wasted their time fruitlessly whilest the ones they faught so hard against in the courts, passed them by and laughed. Good bye rotten apple! OH, hello little green alien looking dude with ice cream in your hand!!! I think the first design is more likely to be produced but the second one is far better. 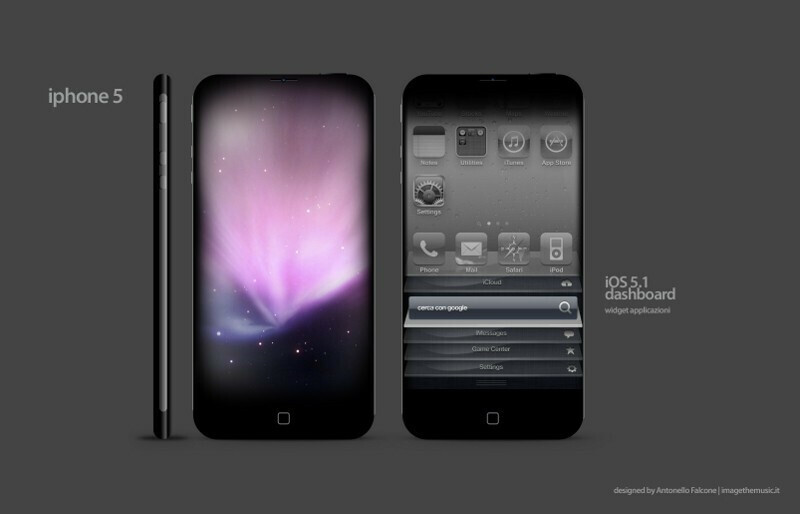 The first design is just an iPhone 4 with a older, curved back. meh. The second looks very nice. But I don't see Apple going to a 4.6 inch display. Plus, looks ate secondary to function. I want to know what its specs are. you mean like all android devices? email doesnt work 90% of the time, constant power cycling, defective touch screens (constant scrolling, "possessed" phones), known call quality issues, terrible keyboard builds, botched updates, etc...the list goes on an on when it comes to android phones of all makes. Not a big fan of Apple after having to send my iPhone 4 off for repair 4 times! 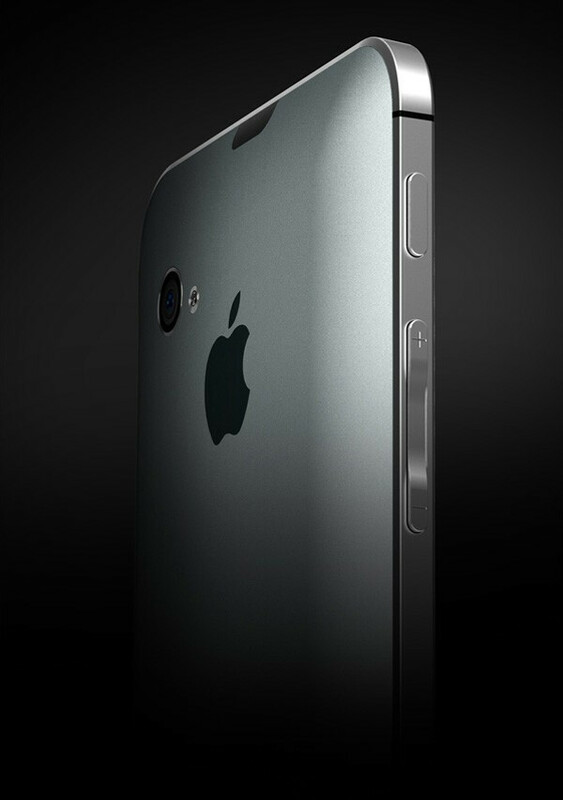 But one thing they never fail to deliver on is stunning looking phones! 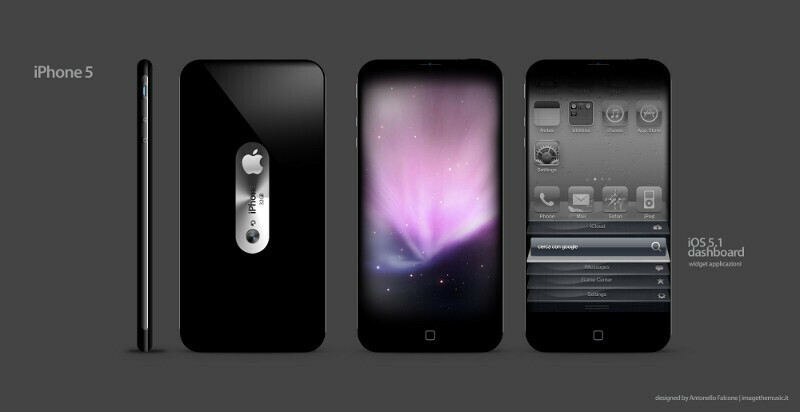 I really like the first design but never gonna go for Apple again after the nightmare iPhone 4 I've got. Falcone's design is great. 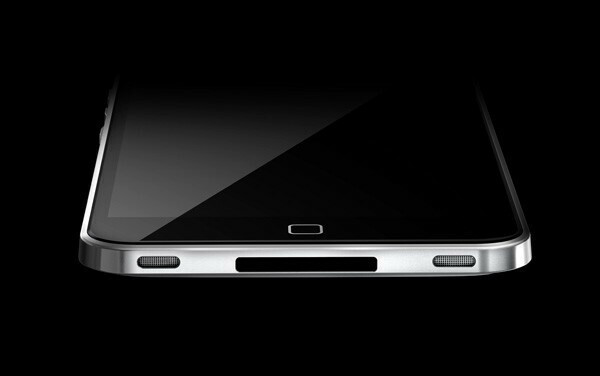 Samsung, this is what the Galaxy S3 should look like. Falcones design is pretty awsome, i would prob get me an iphone that looks like that.. lol it would be like my galaxy except with glass and bigger screen lol!!! i hear ya man. I switched from a Droid X to a iphone4 for about a month but returned my iphone to go back to my X. Its next to impossible to type on a 3.5" screen at the same speed and accuracy of a larger 4.3 display. Also it became immediatly apparent how much I came to depend on widgets and and androids multitasking. Michal Bonikowski's design is awesome!!!! I thought the Apple was going to get rid of physical buttons? If so, haha i smell a lawsuit with Meego and Android 2.4+ devices.